In June 2005, the United States Army officially announced the eligibility requirements for its Combat Action Badge (CAB). The requirements are laid out in a Department of the Army letter that also discussed changes to the Combat Infantryman Badge (CIB) and the Combat Medic Badge (CMB). The CAB, whose design features both a bayonet and grenade, may be awarded to any Soldier performing assigned duties in an area where hostile fire pay or imminent danger pay is authorized, who is personally present and actively engaging or being engaged by the enemy, and performing satisfactorily in accordance with the prescribed rules of engagement, according to the specific eligibility requirements. 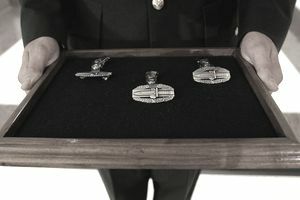 Award of the CAB is not limited by one’s branch or military occupational specialty; however, to receive the CAB, a Soldier must not be assigned or attached to a unit that would qualify the Soldier for the CIB or CMB. "The Global War on Terrorism and its associated operations will be the first era of conflict considered for this award," said Lt. Col. Bill Johnson, Human Resources Command chief of military awards. "September 18, 2001, is the effective date for the new award. That is when President Bush signed Senate Joint Resolution 23, authorizing the use of military force against those responsible for the recent attacks launched against the United States." On May 2, 2005, the Chief of Staff, Army approved the creation of the CAB to provide special recognition to Soldiers who personally engage, or are engaged by the enemy. Intent. The requirements for the award of the CAB are Branch and MOS immaterial. Assignment to a Combat Arms unit or a unit organized to conduct close or offensive combat operations, or performing offensive combat operations is not required to qualify for the CAB. However, it is not intended to award all Soldiers who serve in a combat zone or imminent danger area. (a) May be awarded to any Soldier. (b) Soldier must be performing assigned duties in an area where hostile fire pay or imminent danger pay is authorized. (c) Soldier must be personally present and actively engaging or being engaged by the enemy, and performing satisfactorily in accordance with the prescribed rules of engagement. (e) Other Services and foreign soldiers. May be awarded to members of the other U.S. Armed Forces and foreign soldiers assigned to a U.S. Army unit, provided they meet the above criteria (that is, KATUSAs in 2d ID). (f) Qualifying periods. Award of the CAB is authorized from 18 September 2001 to a date to be determined. Award for qualifying service in any previous conflict is not authorized. (a) Only one CAB may be awarded during a qualifying period. (b) Second and third awards of the CAB for subsequent qualifying periods will be indicated by superimposing one and two stars respectively, centered at the top of the badge between the points of the oak wreath. first two-star general in the chain of command to CG, USA HRC, ATTN: AHRC-PDO-PA, Alexandria, VA 22332-0471. The CAB is categorized as a Group 1 badge (see AR 670-1). Multiple Awards: Soldiers may be awarded the CIB, CMB, and CAB for the same qualifying period provided the criteria for each badge is met. However, subsequent awards of the same badge within the same qualifying period are not authorized. Who May Award the CIB, CMB, and CAB: They may be awarded by any commander delegated authority by the Secretary of the Army during wartime or the CG, USAHRC.